Baubles, bangles and beads have been adorning human earlobes as earrings for as long as five centuries. Not all of their displays, however, were for the purpose of allowing the wearer to make a glamorous fashion statement. Learn how hairstyles, hats, hedonism, economics, and the media have all contributed to the evolution and popularity of this stylish accessory known as earrings. Pierced earrings first made their debut in the Middle East as early as 3,000 B.C. and were intended to provide strangers with a quick and easy clue as to the wearer's religious, political or tribal identity. 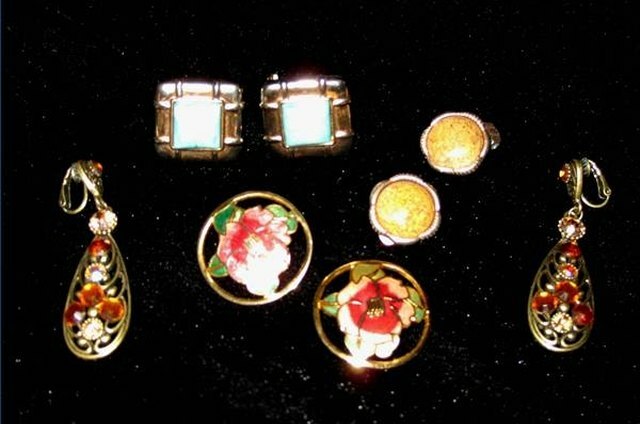 Earrings were also an indicator of the individual's social status in the community and were worn as a matter of choice and pride by those who were in power and as a label of inferiority and shame by those who were enslaved. Originally crafted of metals that could be bent, flattened and twisted into unique designs and hoops, earrings became more elaborate in the second century A.D. when assorted gems were introduced. During the Middle Ages in Europe, the fad of fancy ear bobs that had caught on with society's elite was pushed aside in the excitement of gigantic hats, towering wigs and high collars--a combination that would either completely obscure any ornamentation dangling from one's earlobes or cause it to get tangled in fabric and voluminous locks of hair. With the transition in necklines and more subdued hairstyles at the seventeenth century Italian courts, earrings were once more back in vogue and part of a well-heeled lady's bragging rights that her husband could keep her in frivolous luxury. A century later, however, earrings went back into hiding with the advent of bonnets that framed the face and hugged both sides of the head with wide sashes. With the arrival of 1900, elegant hair piled on top of the head or brushed back into a sleek chignon not only delighted jewelers once more but also led to the subsequent invention of clip-on earrings that were considered more sanitary. The rise of both the movie and the modeling industries put the allure of the earring on its biggest platform ever, with women of all ages wanting to emulate the fashion sense of film stars and cover girls who clearly knew how to accessorize. As for men, the option of wearing an earring dates back prior to Biblical times and, in later centuries, came to be associated with rogues such as pirates and explorers. The wearing of earrings today is primarily ornamental and helps to "tie an outfit together" by using colors that match or contrast with the overall ensemble. The metals, primarily gold or silver, are complementary to the necklaces, bracelets, rings, watches and pins the wearer selects as accessories. Earrings are also an expression of one's personal taste in art and can be made out of wood, plastic, feathers, ceramics, rubber, shells and even food such as pasta, dried beans and various seeds. Earrings can even make a political, religious or social statement by representing campaign propoganda, crosses, or "ribbons" in support of causes such as U.S. troops, breast cancer awareness or empathy for victims of AIDS. The wearing of an earring by a male can advertise whether he is gay or straight, depending on which ear it's worn on. Pierced and post earrings involve piercing holes in various parts ot the ear for the insertion of metal studs or rings. For the most part, these holes are permanent but will gradually reseal if the individual stops wearing the earrings. Clip-on or screw-back earrings are detachable and involve a spring hinge that gently clamps on to the ear and, in the case of screw-backs, can be tightened to ensure a secure fit on the ear lobe. Magnetic earrings come in two pieces, a front and a back, and are held in place by magnetism. Dangle earrings, which come in both pierced and clip-on varieties, extend an inch or two below the earlobe and, when worn for formal occasions, usually include lots of sparkling gems (real or fake). Hoop earrings resemble a ring and come in a wide range of sizes, the larger ones usually being reminiscent of gypsies. Ear threads and needles are plastic sticks and threaded chains for the edgier crowd of earring wearers. Stick-on earrings employ small adhesive strips; most of these are for one-time use at parties as a novelty fashion accessory. Ear cuffs are curved bands of metal or plastic that clip on to various parts of the ear. Earrings can range anywhere in size from metallic or jeweled studs that can be small as half the tip of a pencil eraser to large bangles that can fill the space between the bottom of the ear lobes to the top of the shoulders. In more primitive civilizations, such as parts of Africa, successively heavier ear weights are applied to young girls' ears in order to elongate their ear lobes over a period of time to achieve feminine beauty. While there's no danger at all in wearing clip-on, screw-back, cuff, magnetic or adhesive earrings, there's no shortage of infection dangers inherent in piercing one's ears without the expertise of a professional. In the the 1960s and 70s, for instance, a number of young girls ended up in emergency rooms of hospitals with horrible bacterial infections they received from the do-it-yourself technique of using a large and unsterilized sewing needle and a raw potato to pierce their ears at home. Additional risks in having pierced ears involve unexpected allergic reactions to the various metals contained in the jewelry and the danger of snagging a dangling earring on a sweater or having it accidentally ripped out in a contact sport. What Different Types of Earrings Can You Put in Your Cartilage? 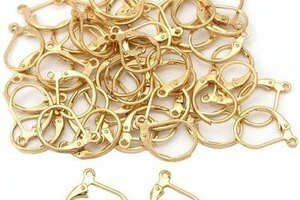 What Are the Different Types of Earring Backs?